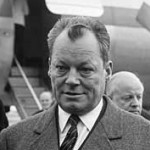 In the federal government formed in late 1966 by the CDU/CSU and the SPD, Willy Brandt is Foreign Minister and Vice Chancellor. The Grand Coalition initiates the modernisation of West Germany. After the elections of 1969, Brandt becomes the first social democratic Federal Chancellor. The government of the SPD and the FDP led by him continues the domestic reforms, advances the unity of Europe and initiates a new Ostpolitik. In 1971, Brandt receives the Nobel Peace Prize. Fiercely criticised by the opposition, he and the SPD win the early elections in 1972. However, an economic crisis and an espionage affair lead to the Chancellor’s untimely resignation in 1974. 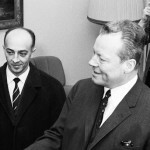 On 31 January 1967 in Bonn, the foreign ministers, Willy Brandt and Corneliu Mănescu, agree on an exchange of ambassadors between the Federal Republic of Germany and Romania. A first, because according to the “Hallstein Doctrine,” the Federal Republic – with the exception of the Soviet Union – has until this time had no diplomatic relations with countries that have recognised the GDR. However, the more flexible Ostpolitik of the Kiesinger/Brandt government meets some resistance. In April 1967, the other Warsaw Pact nations make it clear that they will not adopt relations with the Federal Republic until it legally recognises the GDR and the Oder-Neisse border. 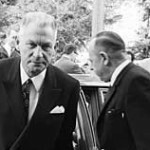 Nevertheless, Brandt will visit Romania in July 1967 and also meet with the independent-minded national and party chief, Nicolae Ceaușescu. 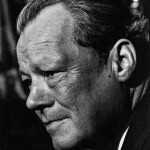 From 7 until 11 February 1967, Foreign Minister Willy Brandt is in the USA. There he conducts discussions with President Johnson, Vice President Humphrey, Secretary of State Rusk and Secretary of Defence McNamara. The American-British-Soviet negotiations on non-proliferation of atomic weapons are the most important subject of the discussions. In principal, the government in Bonn favours such an accord. But Brandt makes it clear in America that a non-proliferation treaty and controls tied to it must not lead to a discrimination against and hindrance of the Federal Republic in its peaceful use of nuclear energy. He reports to the Foreign Affairs Committee of the Bundestag in early March 1967 that the US government has consented to jointly agree on the text of the treaty with Bonn and its other NATO partners. 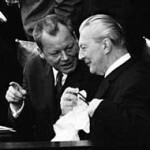 April 1967 is a “European month” for Foreign Minister Willy Brandt. In his appointment calendar are a meeting of the WEU (Western European Union) in Rome, an EEC meeting of the Ministerial Council in Brussels, a visit to London and a meeting with the French foreign minister, Couve de Murville in Bonn. Brandt advocates the further development of the European communities. The Grand Coalition wants to bring about the fusion of the Montanunion, EEC and EURATOM and facilitate the acceptance of new members into the European Community. But just as before, France rejects Great Britain’s membership. On this issue there is no progress, neither at the EEC summit in late May 1967 in Rome nor at the discussions by Federal Chancellor Kiesinger and Foreign Minister Brandt with President de Gaulle in January 1967 in Paris and in July 1967 in Bonn. On 21 April 1967, the military seizes power in Greece in a coup against the democratically elected government. Subsequently, thousands of democrats are arrested and interned. On the list of arrestees is also the name Basil Mathiopoulos, a Greek journalist living in Germany and friend of Willy Brandt. Mathiopoulos, who is filming in Athens at the time, is able to take refuge in the German embassy. In Bonn, Foreign Minister Brandt immediately orders that the asylum seeker can remain in the embassy until his return trip to the Federal Republic is guaranteed. After three weeks of negotiations between the two governments, Mathiopoulos is allowed to leave the country unchallenged. However, in November 1967, the military junta revokes his Greek citizenship. On 8 May 1967, Willy Brandt departs on a trip to Japan. During his eleven-day visit, the German foreign minister is received by Emperor Hirohito and Prime Minister Eisaku Sato. In discussions with his colleague, Takeo Miki, Brandt discusses in particular the consequences of the planned treaty on the non-proliferation of atomic weapons. The governments of the Federal Republic and Japan are in agreement that the treaty must not hinder the peaceful use of nuclear energy. 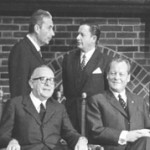 Following the German-Japanese consultations, Brandt takes part in a conference of Federal German ambassadors from 16 to 19 May 1967 in Tokyo, which is devoted to the Southern and Eastern Asian areas and to possible courses of action there for Bonn’s foreign policy. On 2 June 1967, during his visit to Germany, the Shah of Iran comes to West Berlin. Thousands of people take to the streets against the Iranian dictator. The police use rubber truncheons and water cannons against the demonstrators, and that evening the student Benno Ohnesorg is fatally shot. The shooter is a policeman and – which is not known until 2009 – an IM (unofficial associate) of the GDR state security service. With a rapid tempo, the Grand Coalition of CDU/CSU and SPD enact important reforms until the summer break of 1967. 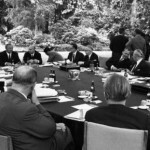 On 6 July 1967, the cabinet agrees on “medium-term financial planning” and a second economic stimulus plan. In mid-May 1967, the Bundestag already passed the “Law for Stability and Growth” which aims at constant economic growth, stable prices, full employment and balanced foreign trade. 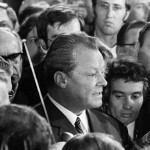 The “Concerted Action” convened by Minister of Economics Karl Schiller (SPD) in February 1967 with representatives of the government, trade unions and employers is supposed to contribute to the “general regulation of the economy.” To the party leadership and to the fraction, Willy Brandt campaigns for these resolutions, by which major demands by the SPD are becoming a reality. On 25 August 1967 at 10:57 a.m., Foreign Minister and Vice Chancellor Willy Brandt presses the red “start” button for colour television in Germany at the 25th International Radio Exhibition in Berlin. In reality, the picture colourises sooner than expected because a technician threw a switch too early. After the USA and Japan, the Federal Republic is the first European country to introduce television on the PAL system. More than 80 million DM are invested in this technical development by ARD (first network), ZDF (second network) and the German Federal Post Office. Only about 5% of West German citizens can profit from it at first because a colour television set costs well over 2,000 DM. The GDR introduces colour television on 3 October 1969. However, there it is broadcast on the French SECAM system. On 13 October 1967, in statements on European and foreign policy in the Bundestag, Foreign Minister Willy Brandt and Federal Chancellor Kurt Georg Kiesinger also address their efforts for easing tensions with the GDR and types of relief for people in divided Germany. Indeed, at the urging of the SPD, Kiesinger accepted for the first time a letter from GDR Prime Minister Willi Stoph and responded to it. But the chancellor is not prepared to undertake direct government-to-government negotiations as East Berlin demands. He does not wish to recognise the GDR as a nation and refers to it as a “phenomenon.” Here a rift is becoming apparent in the Grand Coalition. To Kiesinger’s annoyance, Brandt stated, in August 1967, the ineluctable reality at hand is that two political orders exist on German soil. At a press conference on 27 November 1967, just as four years earlier, French President Charles de Gaulle announces his veto against Great Britain joining the European Economic Community (EEC). For the federal government in Bonn, especially for Foreign Minister Willy Brandt, this is a bitter disappointment. At a meeting in Brussels on 13/14 December 1967, NATO’s Council of Ministers determines a new direction for the North Atlantic alliance. The conference adopts the “Report of the Council on the future tasks of the alliance,” which originates from an initiative by the Belgian Foreign Minister, Pierre Harmel. The “Harmel Report” states that military defence and political détente are not necessarily opposites. Moreover, they represent complementary pillars for peace and security. Therefore, the NATO nations are called on to improve their relations with the Soviet Union. This document corresponds fully and completely to the foreign-policy concepts of Willy Brandt, who warmly welcomes the “Harmel Report.” His handwriting is also clearly discernible in the formulation of the paper. Eleven years after the break in relations implemented by the Adenauer government, the Federal Republic of Germany and Yugoslavia announce on 31 January 1968 the re-assumption of their diplomatic relations. 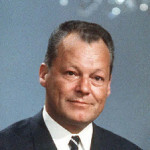 It is the result of negotiations in Paris which the federal cabinet, on 13 December 1967, had authorised Foreign Minister Willy Brandt to undertake. The only condition: Yugoslavian demands for reparations due to the German occupation in the Second World War will not be accepted. As in 1967 with Romania, the Federal Republic is assuming relations with the non-aligned Yugoslavia, although it has recognised the GDR. That contradicts the “Hallstein Doctrine.” But Brandt and Chancellor Kiesinger insist in the Grand Coalition on not excluding Yugoslavia from their policy of easing tensions. By a margin of 97.6%, the Nuremberg party convention confirms Willy Brandt as SPD chairman. Herbert Wehner and Helmut Schmidt are elected as deputies. Subsequently, but with only a slight majority, the delegates approve the formation of the Grand Coalition. The planned state of emergency legislation, against which fierce demonstrations are occurring in front of the meeting hall, is also very controversial among SPD members. In spring 1968, the Extra-parliamentary Opposition (APO) reaches its peak in the Federal Republic. The student movement demands university reforms and protests against the state of emergency legislation of the Grand Coalition as well as against the USA’s war in Vietnam. When an assassination attempt is made on 11 April 1968 in West Berlin against the APO leader, Rudi Dutschke, serious street riots occur in many localities at Eastertime. In an interview on 26 April 1968 with the magazine, “Quick,” Willy Brandt takes a position on the violent protests. In it he also comments on the political engagement of his son which makes quite a stir in the media. Peter Brandt was taken into temporary custody at an APO demonstration on the Saturday before Easter. “Quick” does not publish the sharply abridged interview until 8 May 1968. Despite fierce protests by the APO, on 30 May 1968, the Bundestag in Bonn adopts the state of emergency legislation. It is meant to assure the capacity to act by the government and parliament in the Federal Republic of Germany in case of war, a catastrophe or an uprising and to close a loophole in the Basic Law. On 24/25 June 1968, Willy Brandt takes part in the meeting of NATO’s Council of Ministers in the Icelandic capital city. In the spirit of the Harmel Report of December 1967, the alliance sends an important signal on its policy of easing tensions. NATO offers the Warsaw Pact nations negotiations on a reciprocal and balanced reduction of troops in Europe. An additional subject are the hindrances to traffic to and from Berlin. In mid-June 1968, the GDR imposed a visa requirement for West Germans who want to travel overland to Berlin. In Reykjavik, Foreign Minister Brandt convinces his NATO partners to strongly remind the Soviet Union of its responsibility for free access to Berlin. The Council of Ministers emphasises that the city and its residents must not be excluded from any easing of tensions. 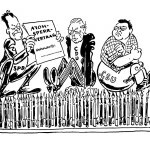 In summer 1968, a fierce controversy breaks out in the Grand Coalition over the Federal Republic’s stance on the treaty for the non-proliferation of atomic weapons. The USA, Great Britain and the Soviet Union negotiated and signed it on 1 July 1968. The GDR is among the 59 nations which immediately join the accord. In a letter dated 15 July 1968, Foreign Minister Willy Brandt appeals to Federal Chancellor Kurt Georg Kiesinger to promptly sign the treaty. Otherwise, the credibility of their own détente policy is at risk. According to Brandt, Bonn’s signature would also deprive East Berlin and Moscow of an instrument of propaganda. However, since the majority of the CDU and CSU favour rejection, the Grand Coalition cannot achieve an understanding on joining the accord. 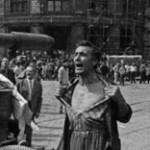 On 21 August 1968, the intervention of Warsaw Pact troops in Czechoslovakia brings a violent end to the reforms of the communist leadership there. The Soviet Union intends to prevent the country from veering away from the socialist camp and to assure its own dominance in Eastern Europe. Willy Brandt condemns the military intervention. He has followed the “Prague Spring” and the idea of “socialism with a human face” with considerable sympathy and initiated efforts toward a rapprochement with Prague. The federal foreign minister decisively rejects the Soviet accusation that the government in Bonn was planning to instigate an upheaval in Czechoslovakia. In spite of the new serious strain on East-West relations, Brandt still intends to hold firmly to his policy of détente. From 29 August until 28 September 1968, the countries which possess no nuclear weapons confer for the first time in Geneva. 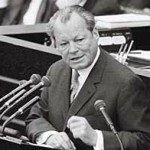 In his speech to the delegates in the palace of the League of Nations, Foreign Minister Willy Brandt reaffirms the Federal Republic of Germany’s refusal to produce or own nuclear weapons. The Federal Republic also has no desire to have any power of control over the atomic weapons stored in West Germany. With a view to the intervention on 21 August 1968 of Warsaw Pact troops in Czechoslovakia decreed by the Soviet Union, Brandt stresses that “the universal principals of international law” must not be violated: sovereignty, territorial integrity, non-violence, all nations’ right to self-determination and human rights. While in New York for the UN General Assembly, Willy Brandt meets on 8 October 1968 with the Soviet foreign minister, Andrei Gromyko. Brandt wants to resuscitate the dialogue on the renunciation of violence between Bonn and Moscow which the Soviet Union broke off after 17 months in July 1968. But there is no rapprochement. Gromyko demands that the Federal Republic legally recognise the borders in Europe and the GDR, declare the 1938 Munich Accord to have been invalid from the beginning and immediately sign the Non-Proliferation Treaty. From the USA, Brandt travels to Chile where he participates in a conference of ambassadors from 14 to 17 October. After discussions with the Chilean government, he also makes official visits to Argentina, Uruguay and Brazil. The National Democratic Party of Germany (NPD), founded in 1964, received only 2% of the vote in the 1965 Bundestag elections. But since the Grand Coalition has been governing in Bonn, the extreme right-wing party has received more and more support. The NPD gains entrance into seven state parliaments and achieves its best result to date in Baden-Württemberg in late April 1968, with 9.8%. 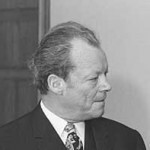 As early as 1967, Willy Brandt has been of the opinion that the federal government should request the Constitutional Court to prohibit the party. In July 1968 he tries to convince Federal Chancellor Kiesinger to join in a common front by CDU/CSU and SPD against NPD propaganda. Although in the end Interior Minister Ernst Benda (CDU) also considers the NPD unconstitutional, on 18 December 1968, the federal cabinet postpones a decision on an application for prohibition. 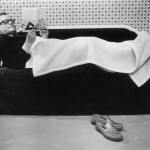 In mid-January 1969, Willy Brandt becomes seriously ill. Due to pleurisy he has to stay in bed for several days and cancel all appointments, among them a visit in London and a ten-day trip to Asia. Shortly afterward he goes for treatment to the Bühlerhöhe Sanatorium in the Black Forest where he recovers until 8 February. Soon Brandt can work some again: write letters, make phone calls and conduct political discussions. On 6 February, for example, he receives the Soviet ambassador in Bonn, Semyon Tsarapkin. Near the end of the month, another sojourn in the USA is planned for the foreign minister and vice-chancellor. To get some additional rest, Brandt takes a ship for this trip across the Atlantic. The crossing from Naples to Halifax (Canada) lasts from 14 to 23 February 1969. Accompanied by disturbances from low-flying Soviet planes, a highly suspenseful election of the Federal President takes place on 5 March 1969 in West Berlin’s East Prussia Hall. Not until the third round of voting is Justice Minister Gustav Heinemann (SPD) able to prevail over Defence Minister Gerhard Schröder (CDU) with 512 over 506 votes. 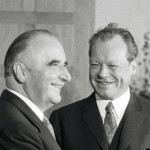 To sound out the chances for a coalition of their respective parties after the Bundestag elections take place in September, the chairmen of the SPD and FDP, Willy Brandt and Walter Scheel, meet in Düsseldorf for a secret discussion in early May 1969. On 17 April 1969, at its exceptional party convention in Bad Godesberg, the SPD adopts its government programme for the Bundestag elections due to take place on 28 September. 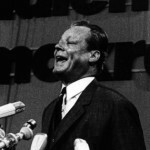 The social democrats are entering the campaign with the slogan “Success – Stability – Reforms” and re-elect Party Chairman and Foreign Minister Willy Brandt as its candidate for Chancellor. To assure peace with its foreign policies, the SPD is also seeking, after its friendship with the West, understandings between the Federal Republic and the East. In domestic policy, it promises stable economic growth and solid finances, more social security and justice as well as reforms of the state and reforms in education. The SPD government programme does not contain a statement on a possible coalition. In spring 1969, the Grand Coalition’s Ostpolitik begins to receive a better reception. In a speech on 17 May 1969, the head of the Polish United Workers’ Party, Władysław Gomulka, offers the Federal Republic negotiations toward a treaty for recognition of the western borders of Poland. The recognition of the GDR is no longer a pre-condition. That signal is registered with considerable attention in Bonn. 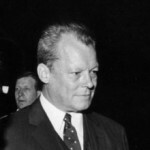 In a letter dated 4 June 1969, Foreign Minister Willy Brandt asks the Krupp manager, Berthold Beitz, to convey, during his upcoming trip to Poland, the Federal Republic’s considerable interest in a dialogue with Warsaw. Movement is also becoming apparent in German-Soviet relations. In January 1969, Moscow presented a paper with proposals for declarations of non-aggression. 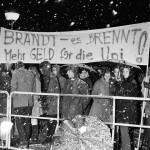 On 20 May 1969, Brandt asks Federal Chancellor Kiesinger not to delay in responding. His answer follows on 3 July 1969. Mostly due to fire fights with China on the Ussuri-river border, the Soviet Union is now more interested in easing tensions in Europe. This motivation can also be recognised in the “Budapest Appeal” of 17 March 1969. In it, the Warsaw Pact nations, with none of the usual polemics against the Federal Republic, propose the convening of a European-wide conference on security and co-operation. As he has already declared to the Bundestag on 19 March 1969, Foreign Minister Brandt wants to sound out the “surprising change of course” in Soviet policy. Early in the morning of 4 June 1969, after very difficult negotiations, the Coalition announces a compromise which the FDP mocks as “Kambodschieren” (“Cambodi-izing”). Relations will not be broken off, but rather “frozen.” The Federal German embassy in Pnom Penh will remain unoccupied. A week later, on its own initiative, Cambodia breaks off relations with Bonn. Despite the up-coming election campaign and the still hardly surmountable differences in Ostpolitik, the Grand Coalition of CDU/CSU and SPD remains capable of action in domestic policy. On 27 July 1969, the Bundestag adopts a law which grants workers, in case of illness, up to six weeks of wage continuation. A month earlier, among other things, reforms abolished penal servitude and culpability for adultery and homosexuality. Further legal amendments adopted in summer 1969 are the improvement in the legal status of unmarried mothers and illegitimate children, inclusion of white-collar employees in the national health insurance system as well as strengthening the federation’s role in the upgrading of universities. 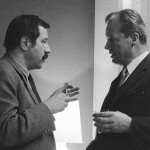 Since 1965, Günter Grass has been campaigning for Willy Brandt and the SPD. To support him and the party even more in the 1969 Bundestag elections, the author, along with other artists, journalists and intellectuals, founds the “Sozialdemokratische Wählerinitiative (SWI)” (“Social democratic voter initiative”). The project quickly finds imitators at the local level. In the Bundestag elections on 28 September 1969, the SPD again gains support and reaches 42.7% of votes. With slight losses, the CDU/CSU nevertheless remains the strongest fraction with 46.1%. The FDP suffers bitter losses and achieves only 5.8%. With 4.3%, the NPD fails to clear the five-percent-hurdle. Since the initial projections predicted an absolute majority of mandates for the CDU/CSU, Federal Chancellor Kiesinger already has himself proclaimed the electoral victor. But at 11:30 p.m., Willy Brandt announces in front of news cameras, that the SPD and FDP together have a slight majority of seats and will negotiate on forming a coalition. For this, he has obtained the agreement by telephone of the FDP chairman, Walter Scheel. Brandt did not even ask Herbert Wehner and Helmut Schmidt, who favour continuation of the Grand Coalition. On 21 October 1969, the Bundestag in Bonn elects Willy Brandt as the first social democratic Chancellor of the Federal Republic of Germany. He receives 251 votes, two more than necessary. But on the side of the social-liberal coalition of SPD and FDP, at least three representatives do not vote for Brandt. Before his swearing-in at the Bundestag, the new Chancellor is handed his letter of appointment by Federal President Heinemann in Villa Hammerschmidt. The same procedure is applied on the next day for the appointment of ministerial positions of which the SPD fills eleven and the FDP four. One member of the cabinet is without party affiliation. Foreign Minister Walter Scheel becomes Vice Chancellor. The core of the coalition agreement, which the two parties were able to conclude within a few days, is in foreign policy and in the policy on Germany. One week after his election, Willy Brandt delivers his first government policy statement at the Bundestag in Bonn. In domestic policy, the SPD-FDP coalition intends to “dare more democracy,” to augment civil liberties, to improve educational opportunities, but also to demand more shared responsibility. To the outside world, Brandt announces a new Ostpolitik. Firmly anchored in the West, the new government will work for a rapprochement with its neighbours in the East, especially with the Soviet Union, Poland and Czechoslovakia. The Chancellor offers the GDR, whose existence as a state he no longer disputes, negotiations on establishing official relations. However, according to Brandt, these could only be of a special nature, since the two German states cannot consider each other foreign countries. The Brandt/Scheel government quickly sets out new signposts. In mid-November 1969, it arranges with the Soviet Union for negotiations toward a non-aggression treaty. These will start in December and, starting on 30 January 1970, will be conducted by Egon Bahr and Andrei Gromyko in Moscow. In addition, the Federal Republic and Poland agree to soon begin with discussions on establishing diplomatic relations. 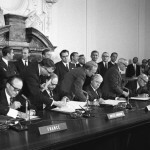 Bonn sets aside a major hindrance for its new Ostpolitik by signing the Nuclear Non-Proliferation Treaty on 28 November 1969.
International indications also point to easing of tensions: On 4 December 1969, NATO offers the Warsaw Pact negotiations on troop reductions (MBFR) in Europe. Twelve days later the USA, Great Britain and France declare their readiness to speak with the Soviet Union about the status of Berlin. 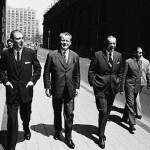 At their meeting in The Hague on 1/2 December 1969, the chiefs of state and government of the six member states of the European Economic Community (EEC) achieve a breakthrough. In 1970, membership negotiations shall begin with Great Britain as well as with Denmark, Ireland and Norway. Federal Chancellor Willy Brandt is credited to a considerable extent with the fact that France’s President, Georges Pompidou, agrees to British membership in the EEC. Fundamentally, the participants in the summit conference also agree on a step-by-step establishment of an economic and monetary union. Furthermore, they arrange for future financing of agrarian policy. These agreements give new impetus to the process of European unity. On 3 December 1969, Brandt reports on the results of the conference with a statement of government policy at the Bundestag. In his first report on the state of the nation on 14 January 1970 at the Bundestag, Federal Chancellor Willy Brandt emphasises the German people’s sense of unity. The self-determination of Germans in a European context of peace remains their ultimate goal. But that should not prevent a well-regulated co-existence of the two German states. Brandt offers the GDR new negotiations toward a renunciation of force and toward relief for people in a divided Germany. On 22 January 1970, he writes a letter to GDR Prime Minister Willi Stoph. The fact that the chancellor no longer wishes to speak of “re-unification,” encounters sharp objections from the CDU/CSU and especially the publisher Axel Springer. In the “Welt am Sonntag” of 1 February 1970, Brandt responds to his critics. 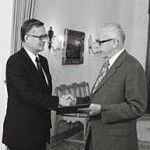 A few days before a visit by the Israeli foreign minister, Abba Eban, anti-Semitic attacks shock the Federal Republic. On 13 February 1970 in Munich, seven Jewish residents of a retirement home of the Israelite religious community die when an unknown individual sets fire to the structure. Leading politicians, foremost among them Federal President Gustav Heinemann, condemn the homicidal act. Federal Chancellor Willy Brandt declares that everything will be done to find the perpetrators. Possibly an extreme left-wing group is responsible for the attack which has not been solved to this day. It is also unclear if there is any connection to Palestinian acts of terror. Due to an attempted hijacking of an Israeli airplane on 10 February in Munich and a bomb attack on two planes on 21 February 1970, 48 people lose their lives. With a calming gesture, the chancellor appears to the crowd which cheers him loudly. “I was moved and sensed that a nation was with me,” he writes later about the incident. The political discussions do not bring about any rapprochement. Stoph demands the legal recognition of the GDR, which Brandt rejects. The only thing they agree on is that a war must never again originate from German soil. 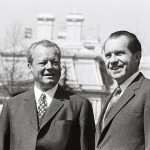 During a short visit to the USA, Federal Chancellor Willy Brandt meets on 10 and 11 April 1970 for two one-on-one discussions with President Richard Nixon. The principal subject is above all the relations between East and West, especially the new Ostpolitik. It is very important for Brandt to inform his most important ally and to exchange ideas with them. As early as October 1969, the advisers Henry Kissinger and Egon Bahr installed a “secret channel” between the White House and the Chancellor’s office. Brandt does not want there to be any doubts raised about the Federal Republic’s firm ties to the West. He had already underscored this in his meetings with the French President, Georges Pompidou, on 30 January in Paris and with the British Prime Minister, Harold Wilson, on 2 March 1970 in London. 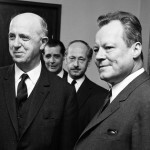 On 23 April 1970, Federal Chancellor Willy Brandt arrives in Oslo for a three-day state visit. The focal point of his discussions with the Norwegian government is the upcoming membership of Norway in the European Economic Community (EEC). A special distinction for the chancellor is the invitation to speak to the Storting, the Norwegian parliament. 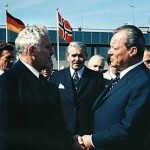 In his speech on 24 April 1970, Brandt emphasises how much he owes Norway, to which he feels so strongly bonded. He also remembers the German occupation of the country in 1940 and honours the understanding and help for the Federal Republic which many Norwegians nevertheless summoned up after the war. Brandt advocates the unity of Europe and names as the goal of his foreign policy the creation of a pan-European framework for peace. On 14 May, Brandt is re-elected party chairman with 318 of 331 votes. The SPD faction leader Herbert Wehner and Defence Minister Helmut Schmidt are again confirmed as deputy chairmen. A good two months after Federal Chancellor Willy Brandt’s visit in Erfurt, the GDR prime minister, Willi Stoph, comes to the Federal Republic on 21 May 1970. Radical right-wing hooligans seriously disturb the course of the meeting in Kassel. Brandt presents a 20-point catalogue for the normalisation of German-German relations. The Brandt-Scheel government is consciously courting the younger generation and the “68ers movement” with their domestic policy reforms. On 18 June 1970, with the agreement of the CDU/CSU, the active voting age is lowered from 21 to 18 and the passive voting age from 25 to 21 years. 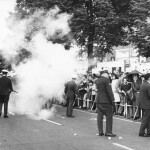 By contrast, the liberalisation of laws concerning demonstrations, which the SPD and FDP already adopted on 20 May 1970, is highly controversial. It also includes an amnesty for previously committed offences such as “unlawful assembly” or “violation of the public peace” which are now either repealed as elements of an offence or else have been newly formulated. In the social policy area, in 1970 the social-liberal coalition adopts an improved support of asset acquisition for employees and an increase in child benefits. 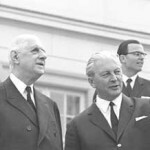 France’s President, Georges Pompidou, visits Bonn on 3/4 July 1970 for discussions with Federal Chancellor Willy Brandt. Subjects of the German-French government consultations are, among others, East-West relations, especially the Federal Republic’s negotiations with the Soviet Union, Great Britain joining the European Community (EC), monetary issues and the foreign-policy co-operation of the EC nations (EPZ). To accommodate demands by the CDU/CSU, Brandt expresses the wish for a stronger inclusion of the European Parliament in the EPZ. Pompidou does agree on having regular consultative meetings of the EC’s foreign ministers. But the President rejects participation of the not directly elected European Parliament, because it is not representative and has no real mandates. 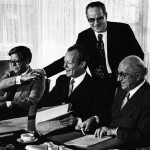 Breakthrough for his Ostpolitik: On 12 August 1970 in the Kremlin, Federal Chancellor Willy Brandt and Prime Minister Kosygin, as well as Foreign Ministers Scheel and Gromyko, sign the German-Soviet Treaty on Non-Aggression and Co-Operation. After that, Brandt meets for the first time for a discussion with the Soviet General Secretary Brezhnev. The inviolability of all borders in Europe agreed on in the Moscow Treaty includes the Oder-Neisse border and the border between the Federal Republic and the GDR. However, the federal government clearly affirms in a letter that German unity remains its goal. 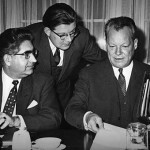 On 18 September 1970, Willy Brandt delivers a statement on the treaty whose guidelines were negotiated by Egon Bahr. The CDU/CSU faction chairman, Rainer Barzel, clearly criticises it. On 24 September 1970, at the Bundestag’s consultations on budgetary legislation for the year 1971 and the federation’s financial plan for 1970-1974, the contrary notions of government and opposition on the condition of state finances and the economic situation in the Federal Republic clash intensely with one another. The budgetary proposal introduced by Finance Minister Alex Möller (SPD) is sharply criticised in the plenum by Franz Josef Strauß (CSU). The CDU/CSU accuses the social-liberal coalition with driving already increasing prices even higher with its increase in public spending amounting to over 12%. Federal Chancellor Willy Brandt rejects this vigorously and speaks of “inflation chatter.” According to him, by comparison to other countries, the rate of price increases in the Federal Republic is relatively low. Making progress in educational reform is a central concern of the SPD-FDP coalition. 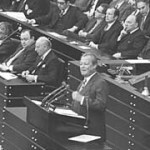 In the Bundestag debate over the federal government’s report on education on 14 October 1970, Willy Brandt himself rises to speak. The federal chancellor insists that educational reform is a “common task par excellence.” He demands that the Federation and States Commission, the German Educational Council, must soon make a decision on a long-term overall plan for education. Even with all the progress for his Ostpolitik, Willy Brandt never tires of stressing how much the unification of Western Europe means to him. On the occasion of deliberations and adoption of two laws which, on the one hand, procure revenues of its own for the European Community (EC) and, on the other hand, broaden the powers of the European Parliament, the federal chancellor delivers, on 6 November 1970, a statement concerning his European policy. 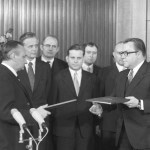 For the 1970s, Brandt proclaims the federal government’s five goals: speedy expansion of the EC, establishment of an economic and monetary union, further development of foreign-policy co-operation by its member nations, establishment of a partnership between the EC and the USA with assumption of international responsibility and communication and co-operation with the nations of Eastern Europe. On 7 December 1970, after negotiations lasting ten months, Federal Chancellor Brandt and Prime Minister Cyrankiewicz sign the German-Polish Treaty in Warsaw. The Federal Republic recognises the Oder-Neisse border as the western border of Poland. In addition, both nations obligate themselves to the renunciation of force and intend to establish diplomatic relations with each other. The Warsaw Treaty, which Willy Brandt justifies in a televised address, is a further milestone of his Ostpolitik. The chancellor causes a world-wide sensation while placing a wreath at the monument in honour of the Warsaw Ghetto Uprising of 1943 when he spontaneously falls to his knees and so commemorates the millions of victims of the genocide carried out by Hitler’s Germany. A small majority of federal citizens disapprove of this gesture and consider it exaggerated. Traditionally, the chancellor of the Federal Republic of Germany and France’s president, as well as ministers of both countries, meet every six months for mutual consultations. On 25/26 January 1971, these consultations take place in Paris. At the top of the agenda for Willy Brandt and Georges Pompidou is the European Economic and Monetary Union, which is supposed to be introduced in progressive stages. Besides that, the two discuss the status of negotiations on Great Britain joining the EEC, in particular the future British financial contribution to the community. Among further subjects are the planned East-West conference on security in Europe, the negotiations on Berlin, Ostpolitik and the conflict in the Middle East. 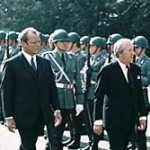 In July and December 1971, there will be two additional German-French summit meetings. Willy Brandt’s major engagement for his Ostpolitik and for West European unity receives high accolades internationally. In January 1971, the American “Time Magazine” chooses him as its “Man of the Year.” Meanwhile, in the Federal Republic, more and more voices are chiding the Chancellor for concerning himself too little with problems of domestic politics. This reproach is also raised by journalists who completely support Brandt’s Ostpolitik. “Spiegel” editor-in-chief, Günter Gaus, demands in an article: A man is needed “for internal matters, for economic policy, including tax planning,” “because no one can actually expect a turn to domestic policy from Partial Chancellor Brandt.” Brandt reacts angrily. In a letter dated 15 February 1971, he writes to Gaus that nothing has hurt him so much for quite some time. At the opening of the Christian-Jewish “Week of Brotherhood,” Federal Chancellor Willy Brandt delivers on 21 March 1971 a well-respected speech for tolerance and against racism. He points out that the commitment to human rights begins at home, and he thereby deplores discrimination against so-called “guest workers” in the Federal Republic. For the first time Brandt also takes a position on his genuflection on 7 December 1970: “Where, if not there, where the Warsaw Ghetto once stood, would the place be for a German federal chancellor to sense the burden of responsibility and (…) to bear the guilt!” The memory of the million-fold murder of Europe’s Jews lends a special distinction to German-Israeli relations, according to Brandt. No one must be allowed to question the state of Israel’s right to exist. 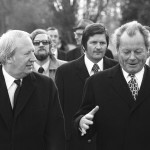 Edward Heath, Great Britain’s conservative Prime Minister, comes to Germany from 4 to 6 April 1971 for an official visit which he begins in Berlin. In his discussions with Federal Chancellor Willy Brandt on 5/6 April in Bonn, negotiations concerning British membership in the European Community (EC) are at the forefront. Despite the harsh demeanour of the French government, Brandt is optimistic. President Georges Pompidou is more flexible than it seems and does want a positive result. In one-on-one talks and in larger circles, Brandt and Heath also speak about foreign-policy co-operation of the EC nations, defence and disarmament issues, the negotiations on Berlin as well as the Ostpolitik. In early May 1971, the Chancellor will travel to London. In a letter to Federal Chancellor Willy Brandt dated 12 May 1971, Finance Minister Alex Möller (SPD) tenures his resignation. Möller mentions the ever increasing expenditure requests of his colleagues in the cabinet and lack of support by the Chancellor as his reasons. His successor is Karl Schiller (SPD) who now, as a “super minister,” holds both the economics and finance portfolios. Möller’s departure occurs amid a currency crisis, which was triggered by a massive influx of dollars to Europe. In order to stem inflation, the federal cabinet decides on 9 May 1971, among other things, to float the exchange rate of the deutschmark and to freeze spending. Two days later in the Bundestag, Brandt calls on employers and trade unions to support price stabilisation with moderate wage settlements. 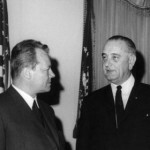 On 12/13 June 1971, after a brief stay in Jamaica, Federal Chancellor Willy Brandt pays an informal visit to the United States. On 15 June in Washington D. C., he meets with President Nixon as well as with Secretary of State Rogers. At the top of a long list of subjects are the Four-Powers’ negotiations on Berlin which are soon to be completed. In addition to that, the President and the Chancellor discuss most of all the planned East-West discussions on troop reductions (MBFR) and security in Europe, the European-American relationship, the international currency crisis and the USA’s rapprochement with China. The subject of Ostpolitik, which some in America have reservations about, is only touched on. At the conclusion of the trip, Brandt stays in New York on 17/18 June 1971. 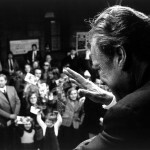 On 13 July 1971 at the Protestant Academy in Tutzing, Federal Chancellor Willy Brandt speaks on the subject of “A Politics for People – Phrase or Programme?” His speech lends insights into the intellectual foundation of the SPD and FDP’s reform policies. In a free society and economy, Brandt explains, many human needs are satisfied by one’s own initiative. However, the political sector is directly required to satisfy certain basic needs. In the Federal Republic there is a need, most of all, for action in the provision of living space, in the health care sector as well as in the areas of social security and environmental protection. The chancellor also points to the great significance of immaterial needs for the “quality of life,” i.e., sexual self-determination, democratisation and justice. After the summer recess, the social-liberal government puts through additional reforms. On 26 August 1971, the Bundestag adopts the Federal Law on Financial Assistance for Students (BAFöG), which is meant to facilitate access to higher education. Students from low-income families can receive financial support. The rights of workers’ councils and employees are augmented by the amended Workplace Labour Relations Act which the Bundestag passes on 10 November 1971. The agreement on Berlin, which the ambassadors of the USA, Great Britain, France and the Soviet Union sign on 3 September 1971, guarantees the access routes to and from Berlin and confirms West Berlin’s “special ties” to the Federal Republic. In late 1971, as a consequence of the Four-Powers’ agreement, the Federal Republic and the GDR adopt a transit accord. An agreement between the Berlin Senate and the GDR government makes it possible for West Berliners to travel more easily to East Berlin and to the GDR. Brandt would like to advance his policy of détente through balanced troop reductions in Europe. However, Brezhnev remains unaccommodating on this point. Unjustifiably, the CDU/CSU and some of his western partners suspect that the chancellor’s Ostpolitik is leading the Federal Republic on a course to neutrality. The Bundestag is debating the federal budget for the year 1972, when Bundestag President Kai-Uwe von Hassel (CDU) surprisingly interrupts the meeting on 20 October 1971, shortly after 5 p.m. He announces that the Nobel Committee in Oslo has awarded Federal Chancellor Willy Brandt the Nobel Peace Prize. The representatives of the SPD and FDP rise and applaud vigorously. In the CDU/CSU fraction, which remains seated for the most part, several members join in the applause. 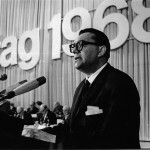 In an exceptional party convention, which begins on 18 November 1971 in Bonn-Bad Godesberg, the SPD holds a controversial discussion on its economic and financial policy. The tax reform planned by the federal government provokes sharp disagreements. A number of proposals by the party’s executive committee do not receive a majority and are replaced by more radical resolutions. Despite clear warnings from Federal Chancellor Willy Brandt and “Super Minister” Karl Schiller, the delegates demand a maximum rate of 60% for income taxes and an increase from 52 to 56% in the corporate income tax. Representatives of the left-wing argue that “the limits of capacity” must be tested for a policy of structural changes. The party convention is continued, then concluded on 17/18 December 1971. 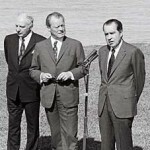 Accompanied by Foreign Minister Walter Scheel, Federal Chancellor Willy Brandt visits Key Biscayne (Florida) between Christmas and New Year 1971 to meet with President Richard Nixon to exchange ideas on the situation in international politics and to reach agreements on East-West issues. At Nixon’s request, who wants to travel to Beijing and Moscow in 1972, Brandt reports on his experiences with Brezhnev and the latter’s views on China. Additional subjects are ratification of the treaties on the East, the discussions of the Federal Republic with the GDR, the EC-USA relationship, the limitation of strategic atomic weapons (SALT), the possible reduction of troops (MBFR) and the conference on security in Europe, the Middle East conflict and the Vietnam War. Afterwards, Brandt takes a few days of vacation with his family in Florida. In order to keep opponents to the constitutional order from civil service employment, Federal Chancellor Willy Brandt and the Minister Presidents of the Länder (federal states) present the following proposal on 28 January 1972: All applicants for a civil service job will in future be investigated for “activities hostile to the constitution” or for membership in “organisations hostile to the constitution.” The regulation is directed above all to members of the DKP, which in 1968 was founded again as a communist party. Protests arise, in the SPD as well, against these investigations by the Federal Office for the Protection of the Constitution and the dismissals which result from them. Although he considers the concern about left-wing extremist subversion to be exaggerated, the Chancellor defends the resolution. However, as early as 1973, he already calls for corrections. Later Brandt will characterise the “Radikalenerlass” (“decree against radicals“) as a mistake. 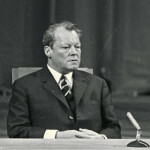 In the heated debate about left-wing extremist violence, in a televised address on 4 February 1972, Federal Chancellor Willy Brandt turns to the citizens of the Federal Republic. The background is an hitherto unsuccessful manhunt for members of the “Rote Armee Fraktion (RAF)” (“Red Army Fraction”), founded in 1970. It is also called the “Baader-Meinhof Gang,” after its leaders, and opposes the democratic system of the Federal Republic with terroristic means. Brandt stresses that the democratic state can neither accept violence nor fail to respond to it and cannot be irresolute. The Chancellor recommends a sober-minded approach, because “blindly striking back” is not in keeping with the Basic Law. 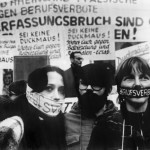 After five attacks with explosives, resulting in four deaths, several RAF members are arrested in June 1972, among them Andreas Baader, Ulrike Meinhof and Gudrun Ennslin. Barely five years after the Shah’s visit to the Federal Republic, Federal Chancellor Willy Brandt travels to Iran. 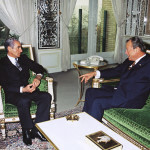 While still in Teheran, Brandt produces a chronicle about his one-on-one discussions on 6/7 March 1972 with Shah Reza Pahlevi and Prime Minister Hoveyda. According to that, he sees good opportunities for developing economic relations between the Federal Republic and Iran, which has major oil reserves at its disposal and wants to expedite its industrialisation. The chancellor praises the country’s achievements in development, but avoids any criticism of the brutal dictatorship and its serious violations of human rights. With regard to planned executions of opponents of the regime, Brandt merely asks the Iranian government to receive a representative of Amnesty International in Teheran. 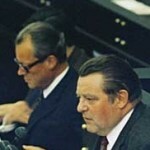 The bitter disagreements on Ostpolitik reach a high point in spring 1972 and deepen the rift between adherents and opponents of Willy Brandt. After several SPD and FDP representatives join the opposition, the CDU chairman, Rainer Barzel, believes he has a majority in the Bundestag. By means of a constructive vote of no-confidence on 27 April 1972, he intends to replace Brandt as Federal Chancellor. In suspense, millions of Germans follow the debate and the vote in Bonn. There are spontaneous work stoppages and rallies of sympathy for Brandt. Quite unexpectedly, Barzel falls two votes short. Rumours of bribery circulate. Not until 1990 is it revealed that the GDR paid 50,000 marks to two CDU/CSU representatives to keep Brandt as chancellor. Since neither side in the Bundestag has had a majority since April 1972, the SPD and FDP have to depend on the co-operation of the CDU/CSU for the ratification of its treaties with Eastern bloc countries. On 17 May 1972, the parliament in Bonn – with a majority of abstentions by the opposition – votes to ratify the Moscow Treaty and the Warsaw Treaty of 1970. With that, the way is open for implementation of the Four-Powers’ Accord on Berlin and the regulations between the two German states combined with it. Previously the three Bundestag fractions had come to an understanding on a “Common Decision.” According to that, the Eastern treaties would not be in lieu of an eventual peace treaty and would create “no basis in law for the borders in existence today.” For Federal Chancellor Willy Brandt, these formulations lie on the verge of acceptable. At the Congress of the Socialist International (SI) in late June 1972 in Vienna, the SPD chairman Willy Brandt is confirmed in the office of Vice President which he has held since 1966. The Austrian, Bruno Pittermann, remains SI President. Among the latter’s deputies is also Golda Meir. Brandt meets with her on 26 June 1972 after a reception at the residence of Austria’s Federal Chancellor, Bruno Kreisky. In February, the Israeli Prime Minister invited the German Chancellor for a visit to her country. Brandt promises to come to Israel as quickly as possible after the Bundestag elections planned for autumn 1972. With a letter dated 2 July 1972, Karl Schiller informs Federal Chancellor Willy Brandt that he will step down as minister for economics and finance on 7 July 1972. The alleged cause is that the federal government took the side of the chief of the Bundesbank (Federal Bank) in a currency policy dispute in late June. However, the primary reason is the lack of support for Schiller’s cost cutting measures. In a letter dated 6 July 1972, Brandt accepts the resignation. He thanks Schiller, but rejects his accusations. The chancellor also responds that the dogmatic demeanour of the “super minister” made working together in the cabinet more and more difficult. Helmut Schmidt becomes Schiller’s successor. With this resignation, the SPD loses one of its locomotives. Schiller even resigns from the party and campaigns for the CDU/CSU. 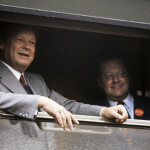 In August 1972, Willy Brandt travels in a special train to vacation regions in the Federal Republic. It is the kick-off to the Bundestag election campaign which is centred on the Chancellor’s high reputation. The impasse which has reigned in parliament since late April between SPD and FDP on one side and the CDU/CSU on the other, can only be overcome by new elections for the Bundestag. In that respect, both government and the opposition are actually in agreement. The Olympic Games in Munich, which were so untroubled until then, are seriously shaken on their eleventh day. On 5 September 1972, eight Palestinian terrorist force their way into the accommodations for the Israeli team, shoot dead two athletes and take nine hostages. Among other things, the assassins demand the release of Palestinians imprisoned in Israel. A crisis management group headed by Interior Minister Hans-Dietrich Genscher (FDP) negotiates the entire day with the hostage-takers. Federal Chancellor Willy Brandt is also on-site. At 8 p.m. he gives a televised statement. Late in the evening the police undertake an attempt to free the hostages which goes chaotically wrong and fails tragically. All of the Israeli hostages, a policeman and five terrorists lose their lives. On 22 September 1972, in order to bring about new elections, Federal Chancellor Willy Brandt, according to article 68 of the Basic Law, places a motion of confidence in the Bundestag. He can only suggest that the Federal President dissolve parliament if a majority votes against the head of government. The intentional defeat is achieved when almost all SPD and FDP ministers who belong to the Bundestag absent themselves from the voting. With that, only 233 representatives express confidence in the Chancellor while 248 vote against him. On the exact same day, Federal President Gustav Heinemann dissolves the Bundestag. Elections are set for 19 November 1972. However, the social-liberal coalition and the CDU/CSU are still capable of compromise: Unanimously, they adopt the Pension Reform Act on 21 September 1972. 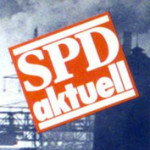 The SPD party convention in Dortmund on 12/13 October 1972 initiates the hot phase of the Bundestag election campaign, in which the party focuses exclusively on its top candidate. Its motto is: “Willy Brandt must remain Federal Chancellor.” The population is bitterly polarised. Brandt is adored and respected by his adherents. He is frequently hated and vilified by his opponents. The Federal Chancellor receives major support from left-liberal media and through the Social-democratic Voters’ Initiative, in which authors, artists, intellectuals and many citizens are participants. Brandt provides for indignation from the opposition with a statement in a “Spiegel” interview in late September 1972, stating that there was undoubtedly corruption involved in the defection of some SPD and FDP representatives to the CDU/CSU. A good two months before admitting Denmark, Great Britain and Ireland, the heads of state and government of the expanded European Community (EC) assemble in Paris on 19/20 October 1972. Among other things, they decide on upgrading the EC to the European Union and on a timetable for the creation of an economic and currency union by 1980. 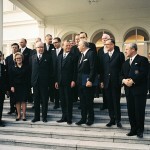 The idea for the summit comes from Federal Chancellor Willy Brandt who closely co-ordinated with France’s President, Georges Pompidou, in preparing for the conference. On 29 October 1972, contrary to the urgent request of the Israeli government, the Federal Republic releases the three surviving Olympiad assassins from prison and flies them to Libya. With that, the federal government and the Bavarian state government fulfil the demand of PLO terrorists who hijacked a Lufthansa plane with 20 people on board on the same day. Israel characterises this as “capitulation to terrorism” and temporarily orders home its ambassador in Bonn. In a personal message to Prime Minister Golda Meir, Federal Chancellor Willy Brandt defends the decision to have given precedence to saving the hostages. Through this direct contact between Brandt and Meir, the grave crisis in German-Israeli relations is somewhat defused. In the early elections to the 7th German Bundestag on 19 November 1972, the SPD achieves an historic victory with 45.8% of the vote. It is a plebiscite for Federal Chancellor Willy Brandt and his policies. Since the FDP under Vice Chancellor Walter Scheel also emerges stronger with 8.4%, the social-liberal coalition has a clear majority. The CDU/CSU with its Chancellor candidate, Rainer Barzel, is clearly defeated with 44.9%. 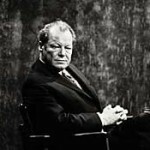 At the height of his political career, Willy Brandt is physically depleted. Due to an operation on his vocal chords which cannot be delayed any longer, he has to check into a hospital on 24 November 1972. After that, Brandt is not allowed to talk or to smoke. For all practical purposes, the Chancellor is unable to take part in the coalition negotiations by the SPD and FDP. On 21 December 1972, after long and difficult negotiations, Egon Bahr and Michael Kohl sign in East Berlin the “Grundlagenvertrag” (Basic Treaty) between the Federal Republic of Germany and the GDR. In it the two German states agree on the assumption of equal and neighbourly relations and the mutual establishment of “Permanent Diplomatic Missions” in their respective capital cities. In the words of Federal Chancellor Willy Brandt, the treaty breaks the ice in relationships with the GDR. His government continues to be firmly dedicated to the unity of the nation. 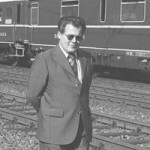 On 26 May 1972, Egon Bahr and Michael Kohl already signed the Transport Treaty, which brings federal citizens considerable facilitation for trips to the GDR. As a result, there is a strong increase in visitor traffic for visits from West to East Germany. Once again elected Federal Chancellor on 14 December 1972, Willy Brandt presents on 18 January 1973 at the Bundestag a government policy statement on his plans for his second period in office. In the speech, which he discussed and agreed on with Vice Chancellor Walter Scheel in early January during a vacation stay on Fuerteventura, Brandt emphasises the continuity of government policies. However, his stated goals sound clearly more reserved than in 1969. The Chancellor was hardly able to exercise influence over changes in the cabinet, in which the FDP now fills five instead of three ministerial posts. In his briefcase, Herbert Wehner “forgot” a memorandum by the then ailing Chancellor for the coalition negotiations. Most of all, the replacement of Horst Ehmke by Horst Grabert as chief of the Chancellor’s office is a poor decision. In early 1973, the continuing decline of the US dollar again causes turbulence in the international currency system. From 2 until 18 March 1973, many European currency exchanges are closed. Therefore, on 11/12 March 1973, six EC nations, the Federal Republic of Germany, France, Italy and the Benelux countries, found the “European Exchange Rate Network,” also called the “currency snake.” With firm exchange rates with one another, the six currencies are able jointly to manoeuver flexibly with regard to the dollar. On 15 March 1973, Federal Chancellor Willy Brandt hails the resolutions. Meanwhile, the strong influx of dollar capital drives up the rate of inflation in the Federal Republic to over 7%. To stem the price increases, the federal government adopts two stability programmes in February and May 1973. 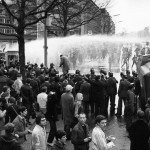 In spring 1973, major unrest dominates the SPD. 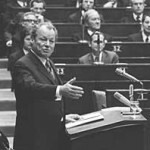 After the victory in the Bundestag elections in November 1972, the Jusos and the left-wing of the party demand “consistently socialist” policies from the chairman, Willy Brandt. However, a renunciation of the Godesberg Programme and from the SPD’s campaign promises is not in the works with Brandt. In March 1973, he indirectly threatens to resign. Herbert Wehner is also dissatisfied with the Chancellor. Surprisingly, the SPD fraction leader no longer runs for deputy party chairman at the party convention in April 1973. Under pressure, Brandt presents himself in Hannover, like never before, as feisty and assertive. 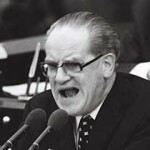 On 13 April 1973, he is confirmed with 404 of 433 votes as SPD chairman. However, in the newly elected executive committee, the left wing is stronger than ever. 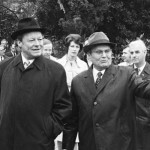 As first German Federal Chancellor, Willy Brandt travels to Yugoslavia on 16 April 1973. The highlight of the state visit is his meeting with Marshal Tito on the Adriatic island of Brioni on 18 April. In one-on-one discussions, the Yugoslavian President emphatically warns his guest about a possible new Arab-Israeli war. 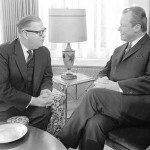 Brandt takes Tito’s concerns very seriously and promises to speak soon with US President Nixon about them. Also on his visit to Israel in June 1973 the Chancellor intends to plea for a peaceful solution in the Middle East. In the highly controversial issue of reparations, Tito and Brandt reach an agreement in principle: The Federal Republic of Germany will not pay Yugoslavia reparations, but rather grant it a generous credit toward the development of economic co-operation. In May 1973, Federal Chancellor Willy Brandt meets in brief succession with US President Richard Nixon and Soviet General Secretary Leonid Brezhnev. At Brezhnev’s first visit to the Federal Republic from 18 to 22 May 1973, three government accords are signed. The Kremlin leader’s high expectations in the area of economics can only be partially fulfilled by Brandt. A formulaic compromise plays down the continuing differences in the interpretation of the Berlin Accord. 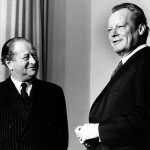 On 7 June 1973, Willy Brandt is the first German Federal Chancellor to come to Israel on a state visit. On the evening of the same day, he travels to the Holocaust Memorial Yad Vashem. Despite mutual personal respect, his discussions with Prime Minister Golda Meir are difficult. Because of German-Arab rapprochement, Israel is concerned about the special nature of its relationship with the Federal Republic. Meir succeeds in convincing Brandt of her reputed desire for peace in the Middle East conflict At her request, he promises to inform Cairo that Israel wishes to conduct direct discussions with Egypt. 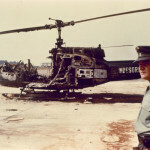 On the final day of the visit, Brandt is fortunate that the helicopter which he is sitting in does not crash. Before the Bundestag in Bonn, the Chancellor evaluates his trip as a very positive experience. 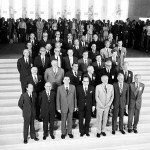 The Conference on Security and Co-operation in Europe (CSCE) begins at the foreign-minister level on 3 July 1973 in Helsinki. The Federal Republic of Germany and the GDR are also included among the 35 participating nations from Europe and North America. To come closer to the distant goal of a European order of peace, the government in Bonn dedicates itself to broadening political détente and complementing it with military disarmament. However, in 1973 Federal Chancellor Willy Brandt must realise with disenchantment that the two are not so easily combined. Single-handedly, Americans and Soviets have separated the CSCE from the mutual and balanced reduction of military forces in Europe (MBFR), which will be conducted by NATO and the Warsaw Pact starting on 30 October 1973 in Vienna. As almost every year, Willy Brandt and his family spend their summer vacation in 1973 in their cottage near Hamar in Norway. Among his personal assistants is Günter Guillaume, who is responsible for the Federal Chancellor’s SPD appointments in Bonn. Since late May 1973, Brandt knows from Federal Minister of the Interior Hans-Dietrich Genscher (FDP) and the President of the Office for the Protection of the Constitution, Günther Nollau, that his associate is suspected of spying for the GDR. However, the security authorities have no proof. Unfortunately, the Chancellor follows their advice to leave Guillaume in his function so that he does not become suspicious. Contrary to Brandt’s assumption, his assistant is not surveilled by the German Constitutional Protection Office. Guillaume even has access to secret telex messages. The “Grundlagenvertrag” (Basic Treaty) between the Federal Republic of Germany and the GDR, concluded on 21 December 1972, is compatible with the “Grundgesetz” (Basic Law), the FRG’s constitution. 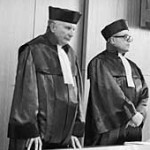 With this judgement, the Federal Constitutional Court in Karlsruhe confirms on 31 July 1973 the opinion of the social-liberal government in a judicial review suit filed by the CSU-governed Federal State of Bavaria. However, Chancellor Willy Brandt and the SPD consider parts of the reasons for the judgement to be detached from reality and a hindrance of their Ostpolitik. The following is stated in the judgement: The German Reich did not fall in 1945, but continues to exist; the border under constitutional law between both German states is similar to the state borders in the Federal Republic and “re-unification” is a constitutional imperative. The GDR leadership reacts with indignation. 1973 is a year of many labour disputes in the Federal Republic. Due to sharply climbing prices, the trade unions demand more than 10% higher wages. When the wage settlements remain below that, the results, especially in the steel industry, are spontaneous, unorganised strikes. In addition, starting in May 1973, a work-to-rule strike by air-traffic controllers hinders air traffic for six months, which affects vacationers in particular. 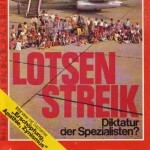 In August the “wildcat strikes” reach their zenith with the walkout of Turkish “guest workers” in Cologne’s Ford plant. 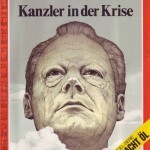 On 28 August 1973, in a statement broadcast on radio and television, Federal Chancellor Willy Brandt calls for preserving the rules for social order, not endangering the position of the trade unions and supporting the government’s policies for stability. As the first Federal Chancellor to do so, Willy Brandt speaks on 26 September 1973 to the United Nations’ General Assembly in New York. Eight days previously, the Federal Republic of Germany and the GDR were simultaneously admitted to the UN. His visit in the USA is overshadowed by reports according to which Herbert Wehner has made disparaging remarks about the Chancellor in Moscow. Brandt is deeply affected and intends to demand Wehner’s resignation. However, back in Bonn he refrains from that – for lack of sufficient support from the SPD. In the Yom-Kippur War, which begins on 6 October 1973 with the attack of Egyptian and Syrian troops on Israel, the Federal Republic officially takes a neutral position. However, the Bonn government secretly tolerates the fact that the Americans deliver weapons across German federal territory to the, at the outset, seriously embattled Israelis. Not until after journalists have discovered that US war materials are being loaded in Bremerhaven onto ships under the Israeli flag does the social-liberal government officially lodge a complaint on 25 October 1973 with the US ambassador in Bonn. According to the Foreign Office, three days after the cease fire in particular, the American course of action is not in keeping with the strict neutrality of the Federal Republic in the Middle-East conflict. The federal government was neither informed nor consulted about the use of Israeli freighters. Federal Chancellor Willy Brandt decides that the loading of freight must be halted immediately and the ships must leave German territorial waters. The USA and Israel react with extremely harsh criticism. On 28 October 1973, in a letter to US President Richard Nixon, Brandt rejects the accusation of deficient solidarity with an ally. But Nixon remains angered, which his reply two days later demonstrates. What Willy Brandt is unable to speak about publically in 1973 is not revealed until the year 2000 by his friend and speech writer, Klaus Harpprecht: During the Yom-Kippur War, the German Bundeswehr also delivered armaments to Israel. The Yom-Kippur War has serious repercussions for the global economy. To put Israel’s supporters under pressure, seven Arab countries curtail crude oil output and, in late October 1973, impose an oil boycott against the USA and the Netherlands. The result is a dramatic increase in oil prices. 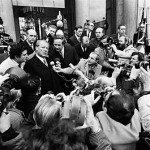 The federal government reacts to the crisis with a law to secure the energy supply which Federal Chancellor Willy Brandt supports emphatically and which is passed on 9 November 1973. Besides the introduction of speed limits, a ban against driving on four Sundays in November and December is also among the immediate measures taken. Since an increase in unemployment is anticipated, the government in Bonn also decrees a stop to recruiting foreign workers. 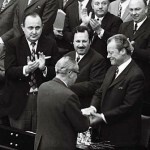 On 13 November 1973, Willy Brandt becomes the first German Chancellor to speak to the European Parliament in Strasburg. In his speech on basic principles, he gives a summary of his vision for a united Europe. At the very beginning, the Chancellor comments on the Middle-East conflict which threatens to create a fissure between Europe and the West. Brandt urges the European Community to unity and defends its statement on the Middle East adopted a week earlier. The fact that the EC for the first time also calls for taking into consideration the “legitimate rights of the Palestinians” angers Israel’s Prime Minister, Golda Meir. She considers this a buckling-under by the Europeans to the Arab oil boycott. On 11 November, Brandt directly feels Meir’s embitterment at a meeting of the Socialist Internationale in London. On his 60th birthday, which Willy Brandt celebrates on 18 December 1973, the Federal Chancellor is at a low point. Characteristic for his mood is the “Spiegel” headline “Chancellor in Crisis” from eight days before: Brandt appears to be withdrawn and irresolute. In the conflict with Herbert Wehner, he has agreed to the latter’s request to try to mend fences again. Doubts begin to grow about whether the Chancellor can solve the many problems he is confronted with. Most of all, the very bleak outlook in the economic situation is troubling to many. 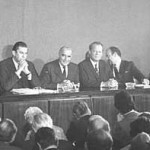 In the energy crisis, the European Community is unable to agree on a common approach at its summit conference in Copenhagen on 14/15 December 1973. Despite the signing of the German-Czechoslovakian Treaty in Prague on 11 December 1973, the momentum in his Ostpolitik has slackened. On 23 January 1974, the cabinet in Bonn decides to establish the Federal Environmental Agency in West Berlin. The GDR interprets this as a violation of the Four Powers’ Accord and threatens to refuse to let the employees of the agency travel on the transit ways. Therefore, Federal Chancellor Willy Brandt asks US President Nixon, by letter, to make the western interpretation of the law clear to the Soviet Union. Previously, Brandt had complained to Brezhnev about the SED regime. In autumn 1973, the GDR doubled the minimum exchange amount for visitors from the West and behaves obdurately towards the Federal Republic. To make some progress in the discussions with the GDR, the Chancellor depends strongly on Herbert Wehner. Since late-May 1973, the SPD fraction head has been in close contact with SED General Secretary Erich Honecker. Starting on 10 February 1974, more than 200,000 employees stop work in the first nationwide strike in the public sector. They demand 15% more money, but federation, states and communes offer only 9.5%. The labour dispute becomes a test of strength between the head of the ÖTV trade union, Heinz Kluncker, and Federal Chancellor Willy Brandt. On 24 January 1974 in the Bundestag, Brandt clearly voiced his opposition to two-digit wage increases so as not to drive up inflation. But after three days of strikes, on which no busses and trains move, offices remain closed and trash is not collected, the employers give in. The Chancellor has to accept the wage negotiators’ agreement on 11% more in wages and salaries. Brandt considers himself the loser and contemplates resigning. 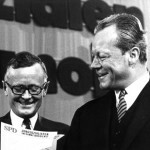 After the SPD suffers major losses in Hamburg’s City Parliament election on 3 March 1974, criticism of party chairman and Federal Chancellor, Willy Brandt, increases. Finance Minister Helmut Schmidt publically bemoans the condition of the SPD and calls for a new organisation of the federal government. Minister of Education, Klaus von Dohnanyi, suggests that Schmidt should become the Chancellor’s “domestic policy deputy” and so relieve him of some burdens. The party’s confidence is strongly shaken. Brandt, however, avoids an open dispute with his critics. On 25 March 1974, in a televised interview, he states that he does not hold with “bringing the thunder.” Brandt re-establishes his authority in a different way: On 2 April, he announces to the press a militant Ten Point Declaration of the SPD which he drafted himself. 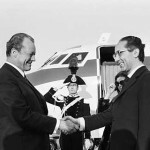 From 19 to 24 April 1974, Federal Chancellor Willy Brandt travels to two state visits in North Africa. In Algiers, he meets with the Algerian President, Houari Boumediène, one of the speakers for the “Third World,” who is calling for a “new international economic system.” The thoroughly controversial discussion with Boumediène impresses Brandt profoundly. It makes him, as he later states, completely aware of the importance of the North-South problem for world peace. 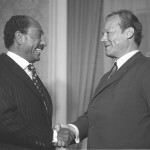 During his subsequent visit in Cairo, the Chancellor conducts several one-on-one discussions with Egypt’s President, Anwar-al Sadat. Topics are German-Egyptian relations, the European-Arab relationship and the Middle East conflict. 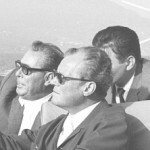 On the flight back, Brandt discusses the details of a planned restructuring of the cabinet with his advisor, Egon Bahr. 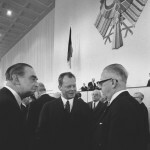 Immediately upon his return from Egypt, Willy Brandt is greeted by Federal Minister of the Interior, Hans-Dietrich Genscher, and head of the Chancellory, Horst Grabert, (SPD) on 24 April 1974 at the Cologne/Bonn airport with a shattering piece of news: Günter Guillaume, one of his Chancellory assistants, has been arrested on suspicion of espionage for the GDR and has already confessed. Two days later, Brandt expresses to the Bundestag his “profound human disappointment.” Mistakenly he states that Guillaume was not entrusted with secret materials. That this is not true, at least for the vacation in Norway in 1973, does not become clear until four days later. On 29 April 1974, the Chancellor is still adamantly against resigning, even if he has already admitted his co-responsibility in hiring Guillaume in the first place. Not only the tabloids are speculating about what the spy Guillaume has possibly revealed to the GDR about Willy Brandt’s private life. On 1 May 1974, the Chancellor is handed a dossier from the Federal Office of Criminal Investigation in which it is alleged that Guillaume had “procured” women for him. In part, the allegations are false, in part exaggerated. Brandt is indignant about the investigation of his private sphere and fears a new campaign of harassment against himself. After a one-on-one discussion with Herbert Wehner on the evening of 4 May in Bad Münstereifel, the decision to resign is made. In a letter handed to Federal President Heinemann on 6 May 1974 at 11:35 p.m., Brandt announces his immediate resignation as Chancellor. Two days, later he assures in a televised address that he is not susceptible to blackmail. Willy Brandt, who remains SPD chairman, called on his fraction, the day before the presidential election, to be cohesive. The alliance of SPD and FDP has a historical dimension and, according to Brandt, will be necessary beyond 1976. He looks back to his own time as head of government with self-satisfaction. His abrupt departure from the office of Chancellor is a profound break for Willy Brandt. In the summer months of 1974, which he spends in Norway with his wife Rut, he writes about his knowledge, his inferences and his suppositions about the Guillaume affair. From Brandt’s point of view, Herbert Wehner is the key figure in his resignation. His suspicion: To bring about the replacement of the Federal Chancellor, since 1973 Wehner collaborated in secret with GDR state and party chief, Erich Honecker. However, there is no evidence for these suppositions. Within his lifetime, Brandt keeps his notations largely under lock and key. Short excerpts are to be found in his book “Beyond the Day”, which is published in autumn 1974. The “Notes on the Case of G.” are not published in their entirety until posthumously in 1994. 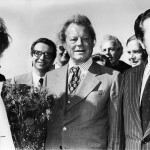 From 19 to 21 October 1974, Willy Brandt travels to Portugal for the first time. Half a year ago, left-leaning military officers there brought down the decades-old Salazar dictatorship in the so-called “Carnation Revolution.” On 20 October 1974, at a large solidarity rally in Porto, Brandt calls for prompt financial and economic aid from abroad to facilitate Portugal’s transition to democracy. The SPD chairman has come by invitation of the Socialist Party (PS). Since its founding in April 1973 in Bad Münstereifel, it has been generously supported by German social democrats. 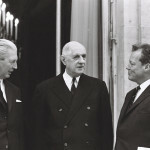 Quite by chance, Mário Soares, the general secretary of the PS, as Foreign Minister of the transitional government, was Federal Chancellor Brandt’s last foreign guest on 3 May 1974. 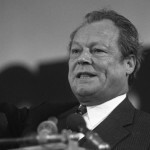 At an event of the ”Mouvement Européen,” the “European Movement,” Willy Brandt speaks on 19 November 1974 in Paris on the subject of “France, Germany and Europe.” The SPD chairman is hoping for new incentives for European unity, which is facing its most difficult major challenge to date. The nine member nations of the European Community (EC) have reacted to the economic crisis brought on by the oil price shock in late 1973 with national unilateralist policies. To prevent a failure of the EC, Brandt calls for an “emergency programme for self-assertion.” Among other things, he pleas for regular summit meetings of the heads of state and government, a common policy for energy and resources as well as for the support of the developing democracies in Portugal and Greece.